Many of us who’ve landed in this enclave known as the Bay Area instantly recognize the good fortune of living on a landscape so diverse and beautiful. Even then, it’s possible to get mired in the pragmatic aspects of life -- and forget just how spectacular even the most common, overly-photographed, and touristy destinations appear to those who arrive on our shores for the first time. So, in an effort to recap some of my best "firsts," and the things which continue to awe visitors, here’s a bullet list of the "musts" every first-time house guest or repeat visitor should experience in our fair land. 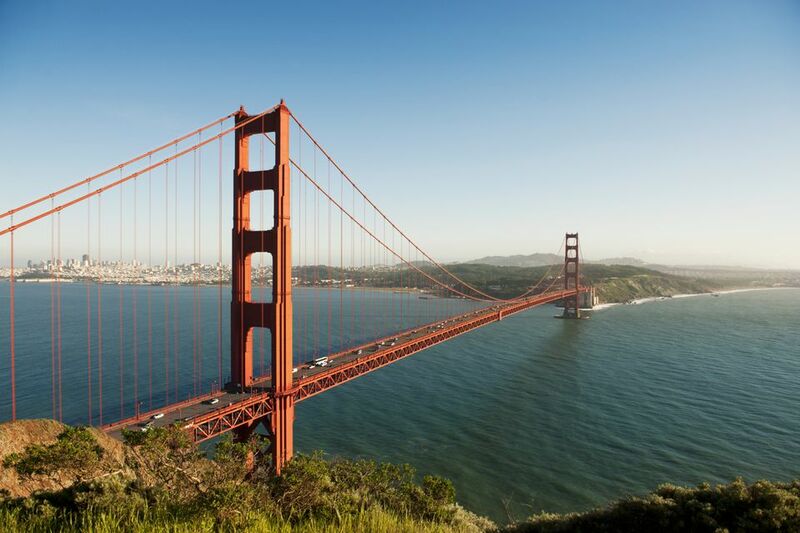 It’s a San Francisco no-brainer, but some people don’t actually walk the Golden Gate Bridge during their visit. Walk or bike, no matter the weather. Fog affords its own mystical trip from the Fort Point end -- to Fort Baker on the north side of the bridge. Eat oysters, chowder, chocolate and cheese at the San Francisco Ferry Building. Check out the food wares from local vendors throughout the Marketplace. Ride the Cable Car. Hop off at the Top of the Mark on Nob Hill for a sunset cocktail. Then hop on again to the Buena Vista Cafe for an Irish Coffee -- the first Irish Coffee ever stirred in the United States. Take a San Francisco Bay cruise and a trip to Alcatraz -- night tour especially recommended. Take an organized walking tour (free or paid) -- including some incredible gourmet food or chocolate walks. You can also opt for a self-guided tour of the old Barbary Coast Trail which takes you through many neighborhoods of the city -- and up to Coit Tower. The base of the tower has a panorama of WPA murals. The top of the tower offers an endless view across San Francisco and the Bay. Visit the San Francisco Presidio and see what becomes of a military installation gone natural. Also in the Presidio, if you haven't done the bike ride through Crissy Field to the Golden Gate Bridge, rent a bike and do it -- or walk from Crissy Field Center to the Warming Hut at the base of the Bridge. Have a coffee and check out the characteristic art of the park souvenirs. It's an unbelievable vista to the bridge. And as you walk past the base of the bridge towers, you can explore Fort Point farther down the line, and watch passing container ships. Or hike/bike up a short hill to get an even better view of the Golden Gate from above. Visit the Legion of Honor and its Rodin collection. Then drop down to the Coastal Trail toward Lands End, planning to arrive near sunset for amazing photo opportunities. At certain times of the year, Brown Pelicans fly over the Lands End lookout just as the sun goes down. It's an awesome vision -- their pterodactyl shadows swooping just overhead. On a calm night, the lights of the Cliff House reflect in the still waters of the Sutro Baths. It’s magical. If you happen to reach the Cliff House earlier in the day, be sure to pay the small fee to see the Camera Obscura. It’s one of about 20 such cameras remaining in the world -- an example early photographic technology. You’ll see a gorgeous, dynamic panorama of Ocean Beach inside. Check out Fisherman’s Wharf -- and say hello to the sea lions at Pier 39. But break the tourist mold and stay closer to downtown. It’s worth a visit to the Wharf see some of San Francisco’s recognizable icons. One disclaimer: Anyone who’s been land-bound may enjoy the waterfront ambiance of Fisherman’s Wharf. Just be aware that it's definitely a tourist destination with a seaside resort atmosphere. Stop in the free Cable Car Barn and Museum for a look at the actual, operating cables and sheaves of San Francisco’s cable car system. The museum also has artifacts and historical information. Check the monthly exhibits at San Francisco’s spectacular museums which cover the full spectrum -- from the classics to our modern age. The structures themselves incorporate innovative designs and architectural pedigrees. See: San Francisco Museums (A to Z). While at the west end of Golden Gate Park, stop in at the Beach Chalet for a beer. Check out the WPA murals covering the walls of the entryway. Visit the not-so-secret alleys in the Mission that house the district’s vivid murals. Walk the neighborhood to see a wealth of color on the walls, and enjoy some of the best food in the city at favorite Mission District eateries. Take a stroll South of Market (SoMa) and through Yerba Buena Gardens. Stop in at the Contemporary Jewish Museum to see the dramatic Daniel Libeskind design. The San Francisco Museum of Modern Art is a hop and a skip from there, as are several smaller museums in the area. While at Yerba Buena Gardens, have afternoon tea at the Samovar Tea Lounge on the terrace, with a view of the gardens. Or sip at another of San Francisco’s favorite tea rooms when you’re roaming the neighborhoods. Walk through the Haight Ashbury district for the stunning Victorian buildings you’ll find there. If you’re seeking the Summer of Love, you’ll be disappointed. But you can take the Flower Power Tour for a bit of insight into the neighborhood’s rock roots. Get an incomparable view of the city from Twin Peaks. Or take a self-guided walking tour to another view point -- Grand View Park in the Inner Sunset. 23. Explore San Francisco's Financial District during the height of the business day when it's at its busiest best -- and when all of the dining establishments of the area are open. 24. While in the Financial District, Experience quintessential San Francisco by dropping in at the Tadich Grill at 240 California (near Battery). Enjoy a cup of chowder and a drink at the bar. 25. If you're a baseball fan, AT&T Park is one of the great retro ballparks in the U.S. -- worth a visit for the ambiance alone. 26. If you’re here for an extended time, take advantage of the beautiful parks and green spaces (San Francisco’s Best Parks). If you’re here in the winter with a car, visit some of the Bay Area’s wetlands for unique nature-viewing. We have a bounty of migrating birds who make San Francisco Bay their winter home. 27. If you have time to venture outside of San Francisco, don’t miss the Marin Headlands and its bounty of trails. Throughout the Bay Area, you’ll find former military installations like Hill 88 and Battery Townsley -- both accessible from the Wolf Ridge Trail and Rodeo Beach. 28. Get a flavor of the city by reading some of San Francisco's local bloggers, many of whom document their travels around town with photographic and culinary observations.